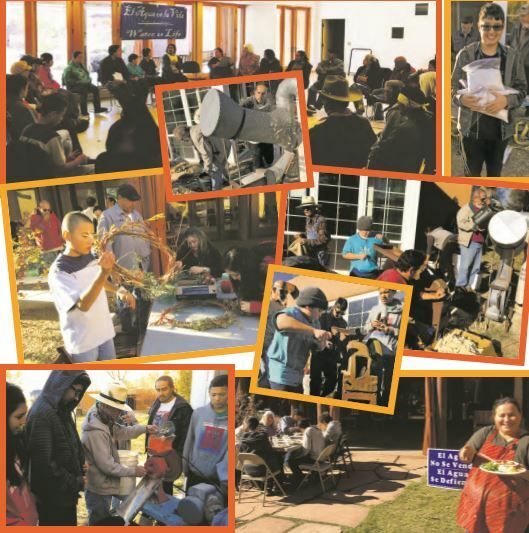 On November 7th our Sembrando Semillas familia came from Abiquiu, Atrisco, Chamisal, Chimayo, Española and Mora to celebrate our end of the year Cambalache at el rancho de Los Luceros in Alcalde. People brought the fruits of their labor and crops from this harvest season to share, like Capulín jelly, fresh salad and veggies, goat cheese, chile, frijoles, maíz y mas. The Cambalache is a way to come together and share the work we have done and what we have learned, and give each other energy and strength to prepare for the seasons to come. Don Antonio Medina led the group in a morning meditation that inspired a sense of awareness and purpose to who we are, and to what we were about to do. After the meditation each group shared stories and pictures from 2015 and we all reﬂected on the amazing work everyone has done. A beautiful and delicious lunch was prepared using all the food and items that were brought. There is something very special about cooking with people you love, and breaking bread with your friends and familia, and it was great to share that time together. During lunch, Toribio, Travis, and all the Semillas helped gather audio recordings for the Sembrando Semillas photo voice project, which premiered at the 2015 Congreso de las Acequias. After lunch we jumped right into our activities: limpiando frijol y maiz, and making dream catchers, wreaths, and medicine bundles. Doña Dora Pacias and Don Lorenzo Candelaria from Cornelio Candelaria Organics (Atrisco) facilitated a workshop on how to process dried blue corn for harina de atole. Lorenzo reﬂects, "The youth participating in this workshop were exemplary; the energy they brought to the workshop is the hope of our future. Joaquin Romero brought blue corn he grew in Mora. He shucked it, lo desgranó; winnowed it, lo ventió; roasted it, tostó; and milled it, molió." Dora and Lorenzo brought a corn shucker, una desgranadora, that has been in his family for generations. My Tio Padrino Qurino Baca, after serving in World War 2, returned to the family farm and realized he needed equipment to do the work that was necessary to produce a sufficient amount. He found the hand cranked desgranadora, and we are still using it today. Gracias Padrino, y a los antepasados por la criansa y herencia que me dejaron. Dora and Lorenzo also brought a winnower, una ventiadora, and we winnowed Marisela Trujillo's frijoles de Chimayo, Joaquin Romero's maiz azul de Mora, and maiz azul de Sostenga Farms. They also brought a mill, un molino, and we milled a fresh batch of roasted Atole. During the afternoon activities people also made beautiful dream catchers, wreaths, and medicine bundles. The good farmers from Chami- sal brought jaras, chamiso, juniper, romero, dried ﬂowers, beads and stones, and others herbs and medicines. We closed our gathering in a circle, to harness the energy and blessings we received, to wish everyone well on their journey home, and to prepare and look forward to our future to come. ¡Que vivan las acequias y que vivan Sembrando Semillas!